Top left: EMS 32M cartridge, rev 2. Top right: EMS 32M cartridge, rev 1. Bottom: EMS 64M USB cartridge. The HKEMS company is probably the oldest manufacturer of Gameboy flash cartridges still in business. Among the original era companies, the most famous was probably Bung, but it eventually collapsed under the legal threats from big N. EMS survived, however, and continues to develop its line of products, including their 64 Mbit GB cartridge. There’s a thread in the Gameboy dev subforum of NESDev about trouble using the cartridge with certain games. In that thread, I said in good faith that EMS cartridges have good emulation of MBC1’s quirks, but also that I needed to investigate it further. Which is what I’ve done this week. And, I was wrong, at least regarding the newer cartridges. First a bit of background: The Gameboy CPU is an 8 bit CPU with a 16 address bus. This allows the CPU to address up to 65536 bytes of memory. In that space, it needs to fit all it’s ROM, RAM and control registers. If you want to address more memory than that, you cannot do it directly, but need to employ a method called bank switching. This is done by a chip called an MBC (memory bank controller) which is situated on the cartridge. The normal memory layout seen by the GB CPU is one 16 kiB area of ROM called bank 0 which never changes, and one selectable 16 kiB area to which any 16 kiB window of the ROM (with a couple of exceptions) can be switched in. In bank 0, a game or program can store code and data it wants to have easily accessible. However, for a flash cartridge this might present a problem if you want the user to be able to choose between different games/programs stored in the flash memory. This is where multi ROM capabilities come into play. Just like the banking lets you select a small window of memory that is visible in the Gameboy memory map, multi ROM lets you select an area of the flash chip which then appears to the Gameboy as a Gameboy cartridge. On the software side of things there’s a menu ROM which scans the flash memory for valid ROM images, presents a menu, and after a user selection performs the special menu sequence to switch the ROM, and finally jumps to the ROM entry point. The USB 64M cartridge (as well as the second revision of the blue, pre-USB 32M cartridges) have reduced functionality compared to the original revision of cartridge. This means that some ROMs will have to be patched in order to run on the cartridge in the future as well. Bummer! The default menu ROM leaves SRAM open (unprotected, [$0000]<-$0A) without good reason. This could potentially trash one bank of SRAM, especially for games that don't use SRAM because they won't enable the SRAM protectopn again. From a quick glance, it seems like the EMS 64M USB utility finally aligns the ROMs correctly to size boundaries when flashing multiple ROMs through the application. However, the menu still has trouble finding some ROMs in an experiment I did. The EMS application also pads the files with $00 (all bits zero) instead of $ff (all bits one) which will contribute a microscopic amount to wearing out the flash faster. Will it actually matter, nah, but it’s a sign of not paying attention to detail. As a proof of concept, I’ve released LittleFM 0.5.1 with integrated EMS multi ROM support. As it is a proof of concept, it does not come with a special patcher, check that ROMs are correctly aligned or handle save data at all. However, to show that I paid attention at least slightly to detail, it does not show repeated entries when used in an emulator, and also gives you an error message if the switching failed, unlike most similar menus. You have to prepare a ROM yourself, by first patching an LSDj ROM with LittleFM as usual, then concatenating whatever ROMs you want at the end, respecting the alignment of course. 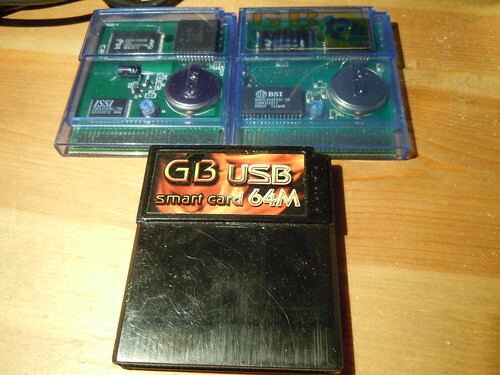 Then burn out.gb as the only ROM onto your EMS cartridge, USB or non-USBB. Press start to bring up the EMS multi ROM menu. Since it doesn’t do save management or anything fancy it’s kind of pointless except maybe for musicians who want noise maker ROMs alongside LSDj on a cart. A future version will be able to store save data in a (compressed) LSDj-like file system, and also come as a standalone menu replacement without LSDj. But that’s for the future. This page was previously hosted on http://gameboygenius.8bitcollective.com/wordpress/2013/03/ (*).